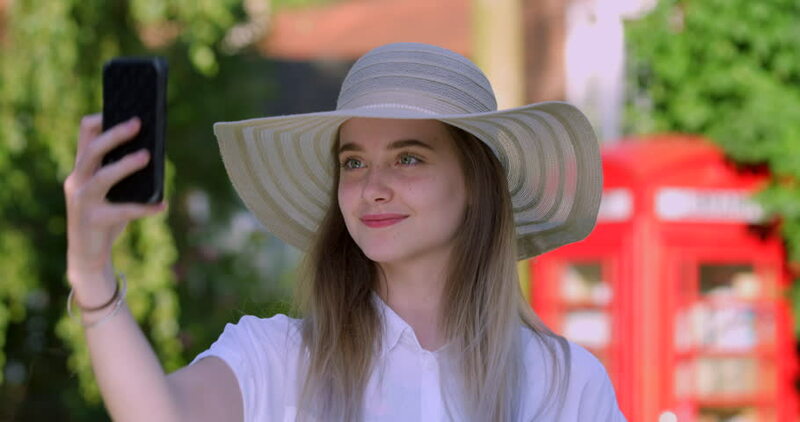 Portrait of Blonde Teen Girl in Hat Waving at Smart Touch Phone and Smiling on web video call to family. Young Pretty Smiling Boho Woman with Long Hair, Green eyes and Freckles. City Summer Holiday. 4k00:13Portrait of Young Smiling Blonde School Girl with next to a British Red Phone box. Student in Sun Hat and Back Pack. A Tourist Schoolgirl on Holiday in Britain in Summer.